On Sunday, we decided to stop bemoaning the lack of snow and get outside, although enjoying sixty-degree temperatures in January seems somewhat sacrilegious. Areas normally unaccessible in the winter by car are currently an easy drive away. 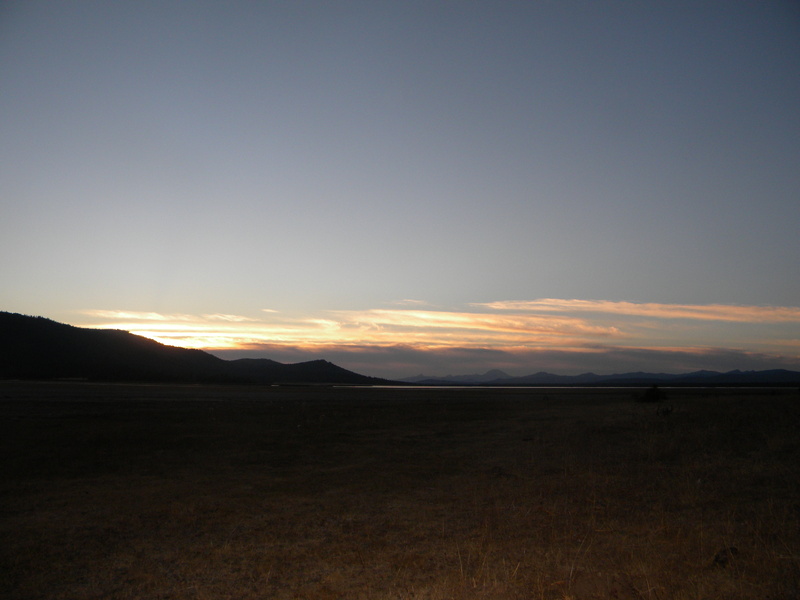 And so it was that we ended up at the shoreline of Mountain Meadows Reservoir. Two years ago, we skied our way out here. As soon as we opened the truck doors, we could hear who was in the neighborhood — thousands of tundra swans, whose earnest, raucous honking overwhelmed the air. We walked around a small point; adults taking the easy path around the shore, girls climbing through dense willow patches and trying to remain unseen. It was warm enough to sprawl out on the grass for a picnic lunch of crackers, cheese and salami before we headed back home. We have also spent a fair amount of time walking out into the woods, which would be impossible in most years. 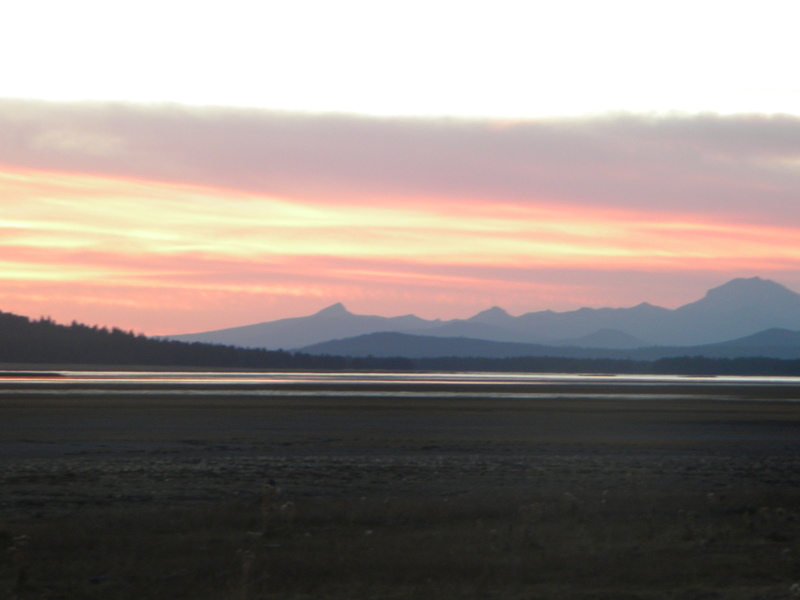 Our ramblings take us up small hills, down logging roads, past rocky outcroppings. Old snowshoe hare tracks caught M.’s eye on a walk up Dead Dog Hill, and she decided to make what she called a “Rabbit Catch.” The idea was that if she collected some enticing food items for the hare and set them out along with a soft place to sleep, she would be able to hide and observe the hare when it came by to nibble and rest. 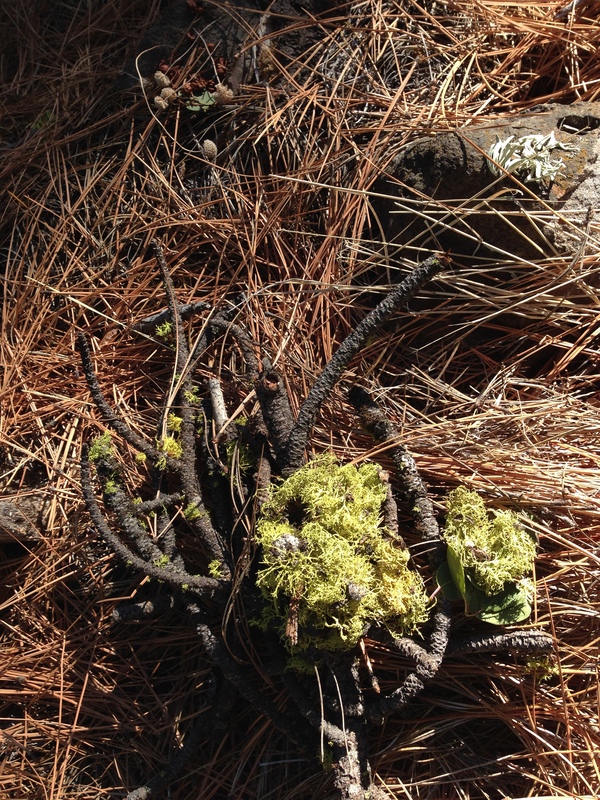 I followed her direction as we collected dried out manzanita berries and evergreen leaves from greenleaf manzanita plants (Arctostaphylos patula), a miniature bouquet of coyote mint flowerheads (Monardella odoratissima), and tufts of chartreuse wolf lichen (Vulpia sp.) These were all carefully arranged on rocks and sticks in a small hollow that M. thought looked just right for a hare to inhabit. We have returned to check on her set-up, and so far there are no takers. I love that she has learned to navigate from our house right back to the same spot. I watch as she follows a logging road, peels off at a skid trail, climbs past a feature she has called the “Sitting Rocks”, and looks for three small firs that mark the spot. Old coyote mint flowerheads — I never noticed how pretty these are, with their downy white calyces still attached to the plant. 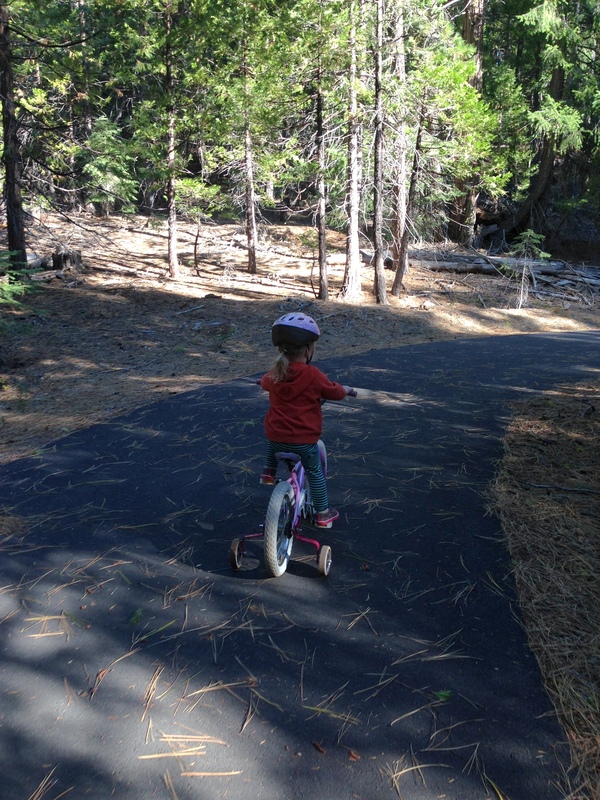 Adventure is relative when you’re three, and for my daughter, an hour-long excursion to the lakeshore via the Lake Almanor Recreation Trail certainly qualified. While M. was out cutting wood with her Papa, A. and I had a rare excursion together, just the two of us. The path twisted through dense forest and at times was barely visible under a dense carpet of needles. I trotted along on foot beside her, providing emergency braking on the downhills, and a few pushes on long uphills. We walked out to the lake on the far end of our journey. 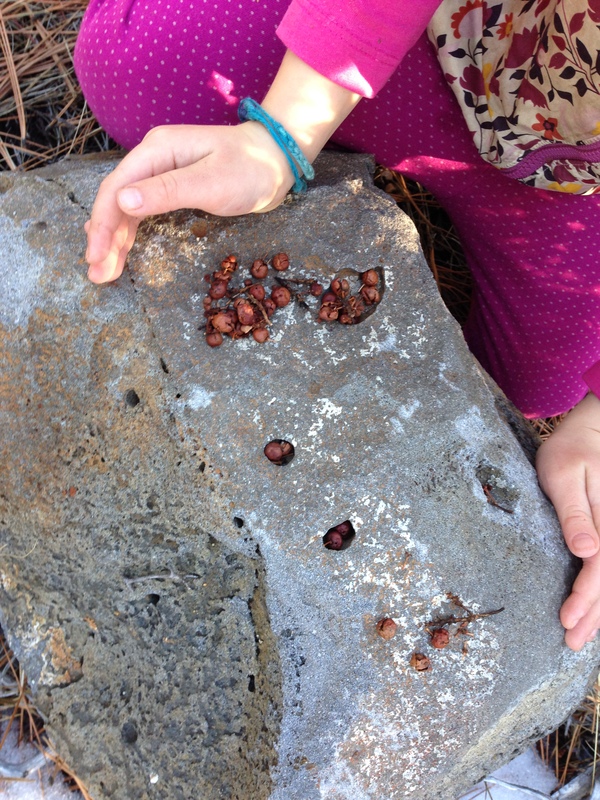 As always, A. filled her pockets with treasures, including feathers, fuzzy mullein leaves, and snail shells. The reward for her efforts? Whole-grain waffles, fresh-baked quiche, and hot cocoa at the Lakeside Cafe in Hamilton Branch. Yum! Out for a ski date. Our destination was just a few miles from home, yet we skied in total solitude as far as human company was concerned. Mountain Meadows hums with wildlife this time of year. 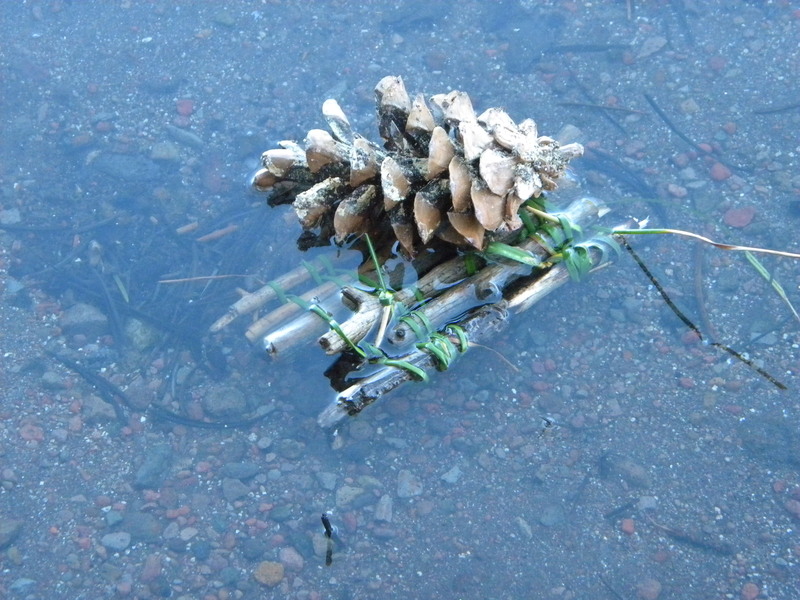 The lake remains iced over, save for pockets of open water near springs at the edge of the lake. 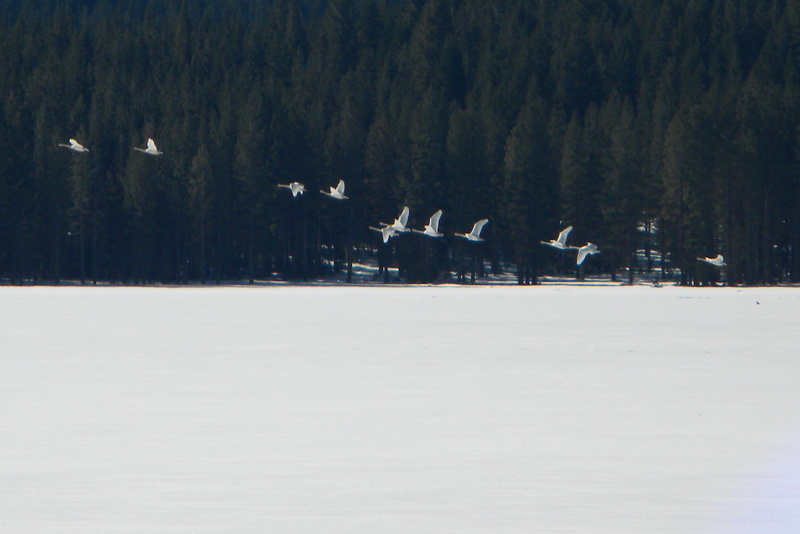 And this was where hundreds of tundra swans congregated, before they were spooked into flight by the rasp of our skis on icy snow. They are over-wintering here, preferring our version of winter to their arctic breeding grounds. 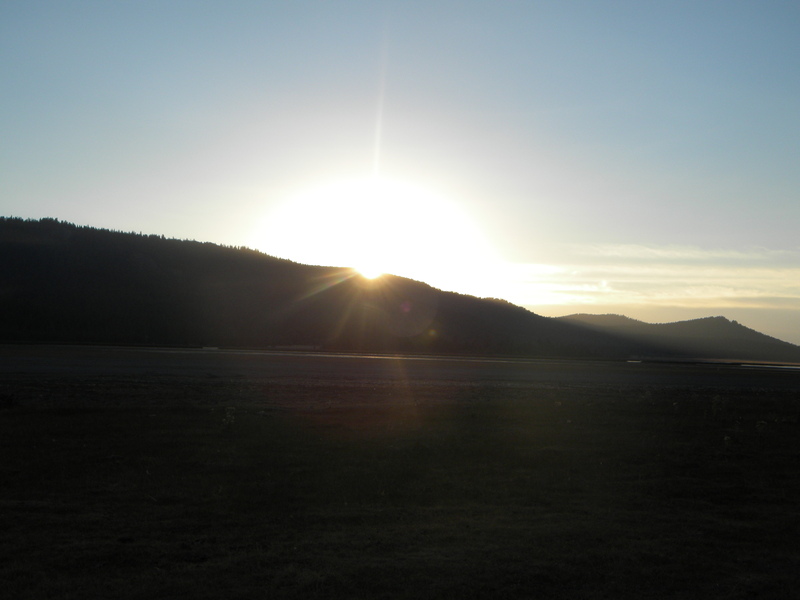 Bald eagles spun lazy circles overhead, while at our feet lay evidence of animals unseen. Bobcat, coyote and raccoon had all complicated the smooth snow with a jumbled web of tracks. 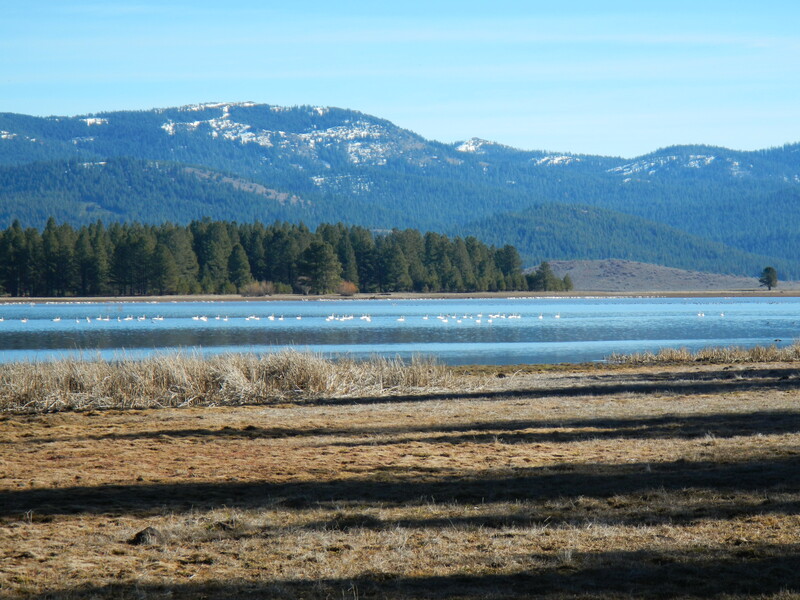 Tundra swans on open waters at Mountain Meadows. Up to Lassen Volcanic National Park on a blue-skied but bitterly cold day. My sainted husband took the girls sledding near the Kohm Yah-mah-nee Visitor Center at the southwestern entrance, which freed me up for a short ski. Apparently my 4-year-old was flying headfirst down the hill so fast that bystanders gasped. Yes, there are some things that it is better that a mother not see. Meanwhile I skiied the well-trod path along the Park highway to Sulphurworks, roughly 2 miles roundtrip. 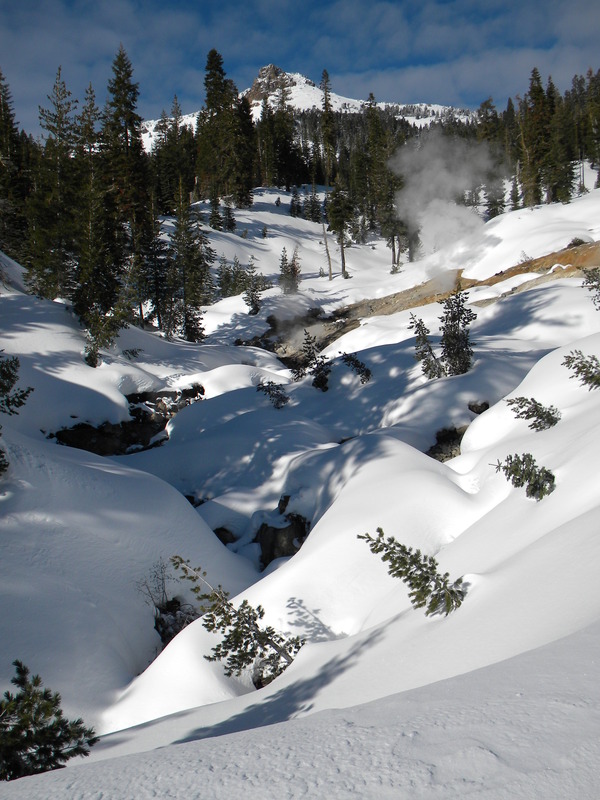 Though over six feet of snow blanketed the highway, heat from hydrothermal activity had melted away every last inch at the Sulphur Creek crossing, leaving the pavement exposed. Then back into the toasty warm Visitor Center for hot chocolate. M. began working toward her Junior Ranger badge this visit. I love that earning a badge requires a bit of time and effort! Good motivation to return to the park this summer so that she can finish up. Papa heads out to sled with the girls. At Sulphurworks, with Mount Diller in the distance. Out to Mountain Meadows yesterday evening to mark the passage from summer to autumn. I am happy to be at this fulcrum; to begin the tilt toward winter. Our summer fairly burst with hard work and play as we spun off in a million different directions to drink in the light while we could. 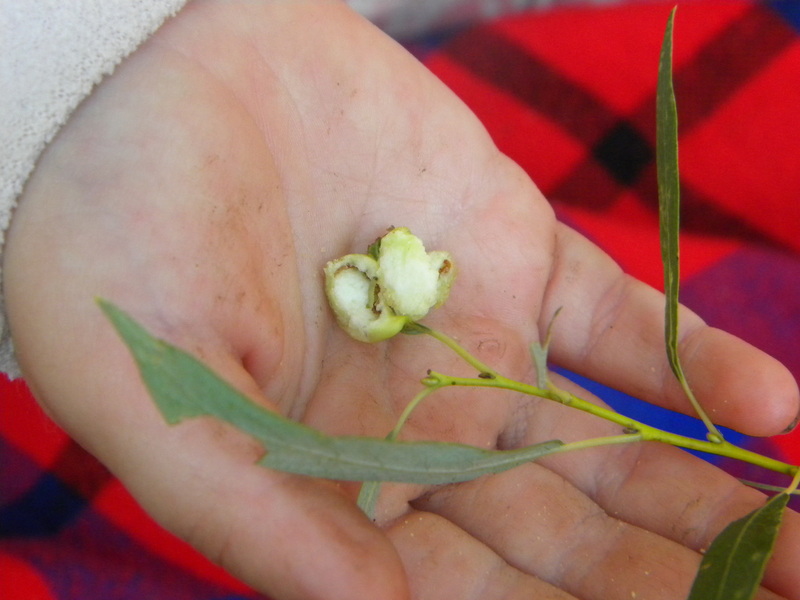 We endured the frantic summer schedules of a botanist and a forester, where we must accomplish much work within the limited window that summer offers. And now, I am ready to retreat, to pull back indoors, take a few deep breaths, and await our seasonal return to slightly simpler days. A crackling woodstove, extended evenings, falling snow. The wildfires near us have at last abated, and we can venture out into our forests under clear blue skies. 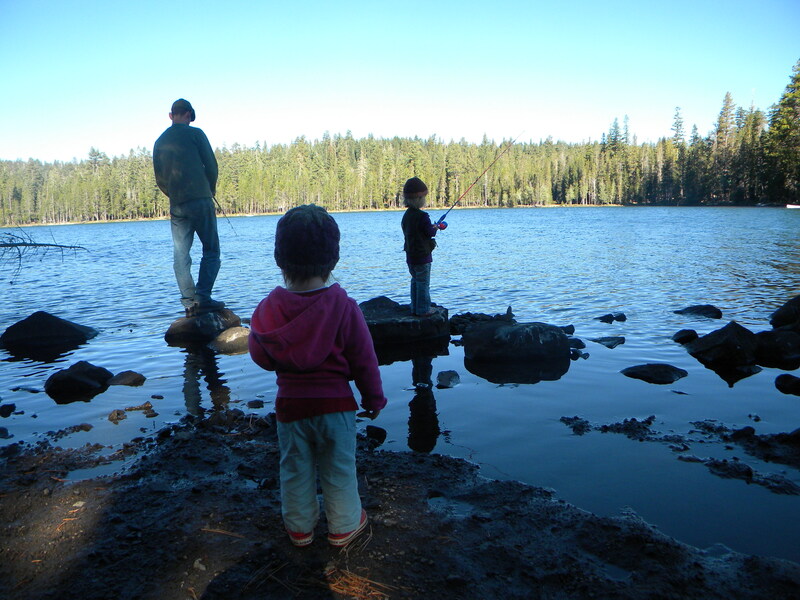 This morning, we made a family trip up to Silver Lake, at the edge of the Caribou Wilderness. 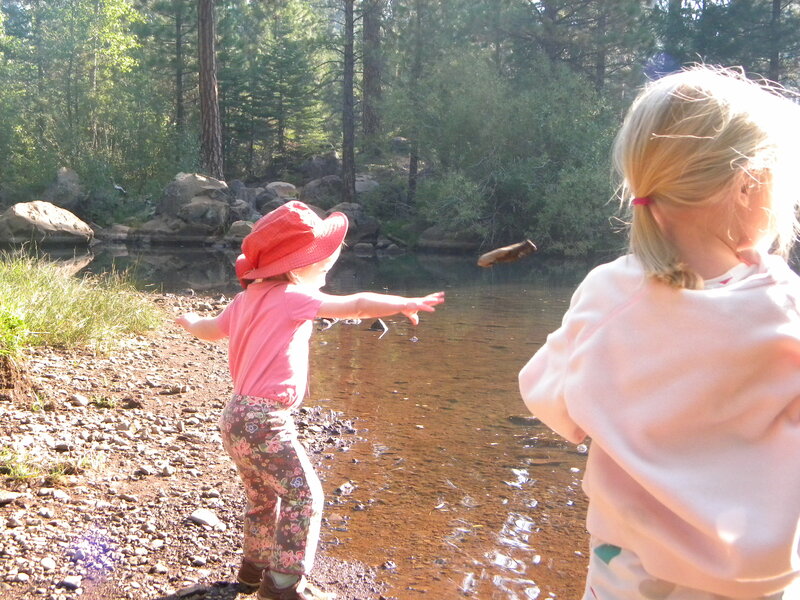 This was M.’s first fishing trip, and she was elated that this long-awaited moment was coming to fruition. And if the sheer prospect of fishing weren’t joyous enough, her new fishing pole is PINK. Oh, this was happiness squared for my daughter. M. took the whole fishing business very, very seriously, and hung on to every word of her Papa’s tutelage. Cast, wait, reel, repeat. Though the morning was windy and hopes of success slight, she patiently waited for her first bite out on a rock in the water. Meanwhile, A. and I found plenty of shoreline fun following deer tracks, watching the yellow jackets hover at waterline, and building tiny rafts from twigs and sedges. M. and Papa failed to coax even a nibble from the fish of Silver Lake. 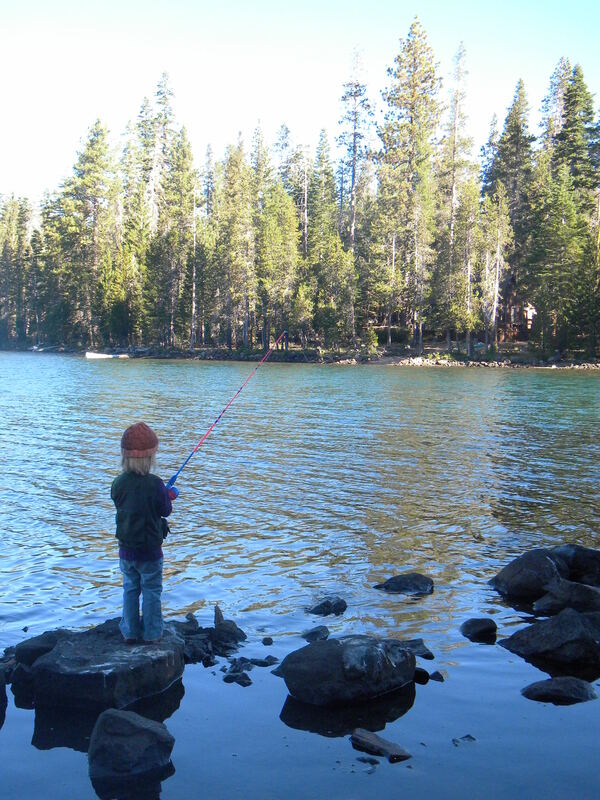 No trout will grace our dinner plates tonight, but M. wants to go fishing again, so in that respect, the trip was an unqualified success.